The French ecology ministry has tasked the schooner La Boudeuse, skippered by Patrice Franceschi, with a special environmental mission, supported by CNES. The expedition launches in August. La Boudeuse sets sail in August. Credits: La Boudeuse. “La Boudeuse is 48 m in length, has 13 sails and uses 6 km of rope and 200 pulleys—each one made by hand,” explains Amaury Bironneau, onboard administrator on the last three-mast explorer in the world. The captain of the French vessel, Patrice Franceschi, has been mandated by the French ecology/environment ministry* to undertake a second mission to meet people groups around the globe. La Boudeuse is now being readied to take to the sea. 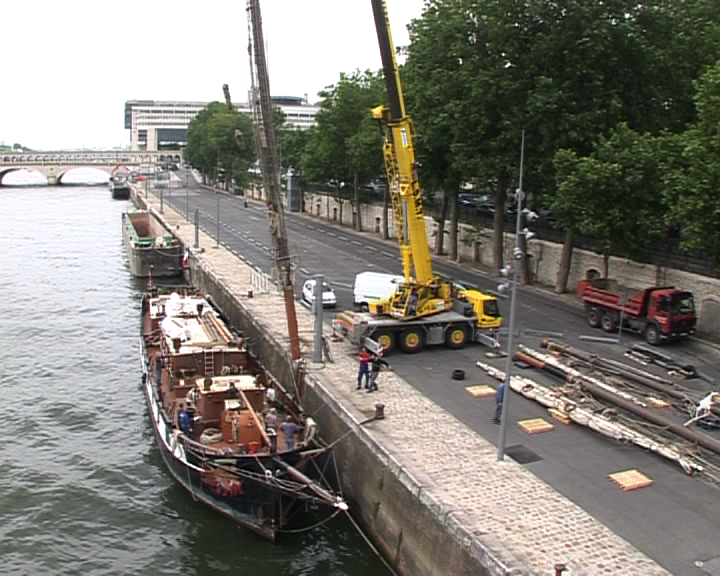 La Boudeuse arrived in Paris in 2007 and for the last year and a half has been berthed at Quai François Mauriac, where visitors can look round the ancient vessel and admire its impressive rigging. Amaury Bironneau (right) with a Bajau fisherman in the Komodo Strait, Indonesia. Credits: La Boudeuse. La Boudeuse will set sail in August, heading south toward Africa to take advantage of the trade winds across to South America and Cayenne, French Guiana, its first port of call. But first, the ship had to be dismasted and taken down the Seine to Le Havre for maintenance. The strip-down operation took place on 26, 27 and 28 May. Dismasting of La Boudeuse, Quai François Mauriac, Paris, 28 May 2009. Credits: CNES. The message from French ecology/environment minister Jean-Louis Borloo is simple. sustainable development, biodiversity and intercultural dialogue. Under a partnership with CNES, the ship will carry an ABCsat* telecommunication kit. This will connect La Boudeuse directly with the CCMM maritime medical consultation centre in Toulouse throughout the expedition. “We thus hope to contribute to improvements in satellite telecommunication systems and their applications in telemedicine,” concludes Amaury Bironneau. L’Ecotaxe des poids lourds, par satellite ?